As the oldest of the residential colleges in Adelaide, St Mark’s has a rich and interesting history. The Reverend K Julian F Bickersteth moved, and Sir Lancelot Stirling seconded, a motion in the Anglican Synod of the Diocese of Adelaide that a committee be appointed to consider what steps should be taken to establish a college for students of the University of Adelaide. 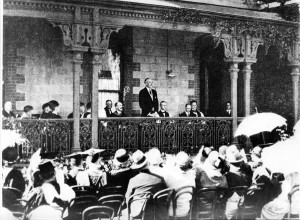 A public meeting was held in the Adelaide Town Hall on 29 May which led to the formation of a large General Committee and an Executive Committee to found the College. 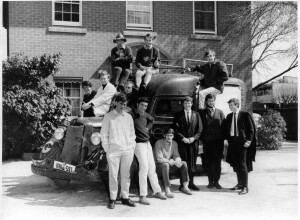 An Appeal for donated funds was launched to establish the College and an Agreement was made to purchase the historic former residence of the Downer family on Pennington Tce. Situated close to the University, this heritage listed property was built in 1877. The name “St Mark’s” was chosen for the new College to honour the saint on whose day the ANZAC landing at Gallipoli took place. Archibald Grenfell Price was appointed as its first Master. The first St Mark’s College Council was elected. The first General Meeting of the Common Room (St Mark’s College Club) was held on Wednesday, 11 March. 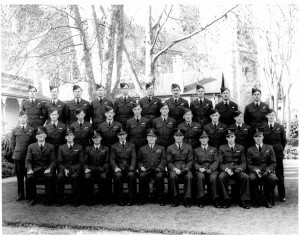 The College was leased to the RAAF for the duration of World War II and the students were relocated to two lodging houses and a villa in Kermode Street. 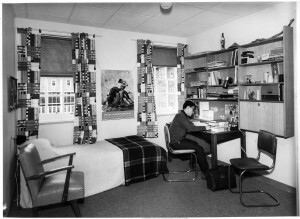 Here, common meals and tutorial rooms were provided. 13 Rhodes Scholars were residents of St Mark’s in recent years. The College’s commitment to producing well-rounded and confident individuals is reflected in the significant number of Rhodes Scholars. These reputable scholarships enable the recipients to undertake further study at the University of Oxford and are awarded on the basis of academic achievement, leadership, commitment to the public good and on personal qualities including truth, courage, unselfishness and fellowship. 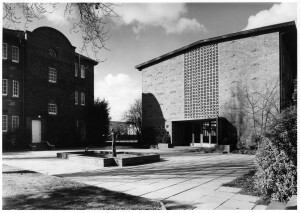 In the third term, the first stage of Memorial Building (the central section) was available for occupation. The College Coat of Arms was formally granted by The College of Arms, London. The “New Wing” was renamed in honour of Sir Henry Simpson Newland, a founder, Foundation Fellow and former Chairman of the Council for more than 25 years. Appointment of the Vice-Master, Mr Robert Brook Lewis AM, as the second Master of the College. 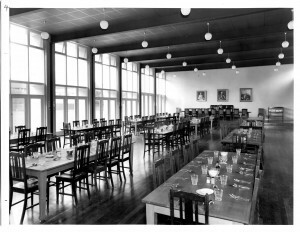 The new Grenfell Price Dining Hall was opened for use on March 17, with 15 bed-study rooms and loft above. 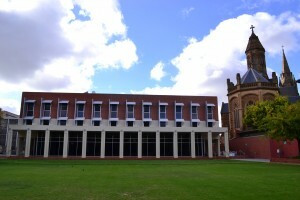 The sixth and final stage of Newland Building was completed and the whole building renovated. The figures of St Mark and the Lion fountains were presented to the College by the Downer family. A College icon, The Gas Truck, a 1936 Dodge, was purchased and rebuilt by students at St Mark’s for its new role as a means of transport for College residents. Rev’d Malcolm McKenzie, Chaplain of St Mark’s College, was appointed as the third Master. 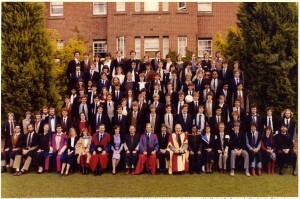 Dr Peter Geoffrey Edwards AM succeeded Rev’d Malcolm McKenzie as the fourth Master of the College. Women undergraduates first admitted to the College. The Cottage renovations were completed and the building re-opened as Walkley Cottage. Rev’d Peter Thomson AM installed as the fifth Master of St Mark’s. Mr C Robin Ashwin appointed as the sixth Master of St Mark’s College. Opening of the Brooks Gates on the College’s Pennington Terrace frontage. The Hon John Charles Bannon appointed as the seventh Master of the College. Restoration of The Gas Truck. Installation of the former Dean of the College, Ms Rose Alwyn, as the eighth Master of St Mark’s and the first female in this role. The College celebrates its 90th year with the official opening of the East Wing building on 1 March, bringing total student rooms to 248, with a new Academic Centre, larger Allister McLeod Gymnasium, and resident car park.